Confused about how the Unified Payment Interface can change the way you bank? Here is your guide to understanding how it works. Mobile banking has gained momentum in India like never before. It has grown by 212 per cent in value terms in February 2016 over the same period in 2015 and by 131 per cent volume. In such a scenario, the launch of Unified Payments Interface (UPI) would further bring about a significant shift in the way mobile banking transactions are conducted in India. By using UPI, customers would no longer need to wait for hourly batches of National Electronic Funds Transfer (NEFT) to send or receive funds or seek MMID code for Immediate Payment Service (IMPS) transactions. Thus, instant money transfers every minute will actually be a reality now. 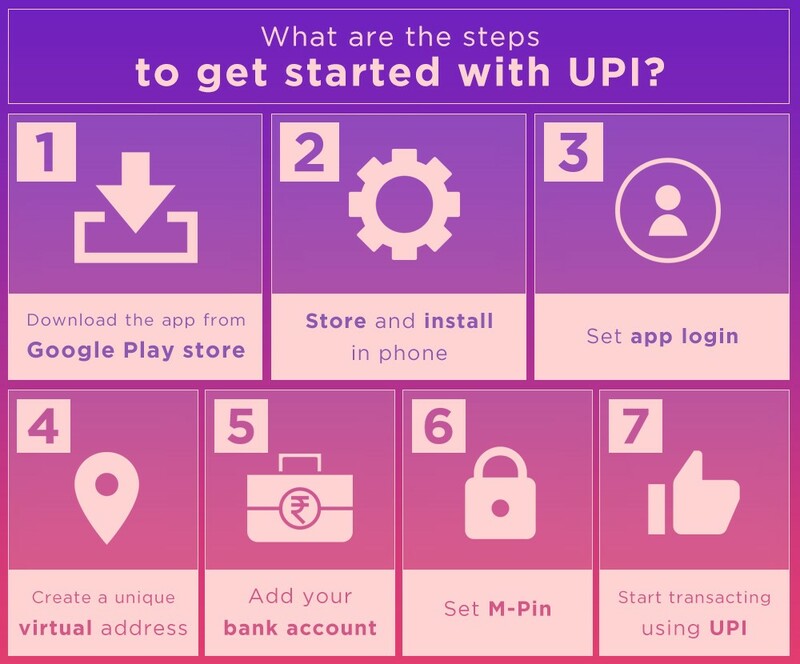 Here is everything you need to know about UPI and how it can make banking easier like never before. Developed by the National Payments Corporation of India (NPCI) and the Reserve Bank of India (RBI), UPI is a payment system that allows money transfer between any two bank accounts by using a smartphone, thus, enabling instant transfer of money using a cashless system. Through UPI, you would be able to pay directly from a bank account to different merchants, both online and offline, without the hassle of typing credit card details, IFSC code, or net banking/wallet passwords. Using UPI services, all what you will need is the smartphone, mobile number of the recipient and your banking app to make the transactions in a secure environment. UPI is very safe as you will be required to share only the virtual address and no other sensitive information. Further, UPI will be based on the IMPS framework making transactions highly encrypted and fully secure to use. UPI is all set to go live for customers with 21 banks in India. Where to download the UPI app? The UPI app of 19 banks i.e., Andhra Bank, Axis Bank, Bank of Maharashtra, Bhartiya Mahila Bank, Canara Bank, Catholic Syrian Bank, DCB Bank, Federal Bank, ICICI Bank, TJSB Sahakari Bank, Oriental Bank of Commerce, Karnataka Bank, UCO Bank, Union Bank of India, United Bank of India, Punjab National Bank, South Indian Bank, Vijaya Bank and YES Bank will be available on the Google Play Store of Android phones in the next few days for customers to download. According to NPCI, two banks i.e., IDBI Bank and RBL Bank are on-boarded as issuers. The customers of the two banks can download any UPI enabled apps and link their account. Versions for Apple’s iOS operating system will take up to six more months to go live. What kind of transactions can be performed via UPI? UPI will allow you to send and receive money as well as make use of its integrated payment system to make merchant payments, remittances, bill payments among others but the per transaction upper limit is Rs.1 lakh and the minimum is Rs.50. 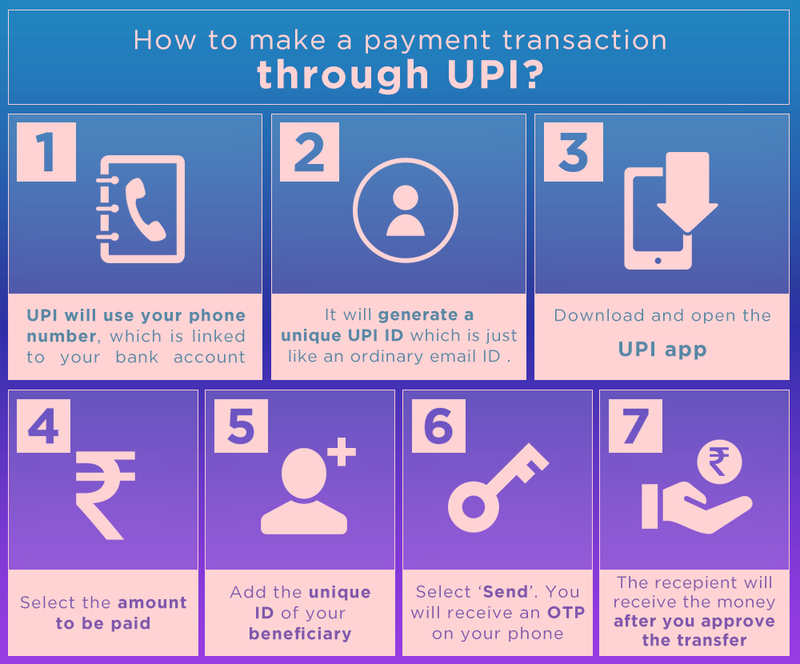 How to make a payment transaction through UPI? For sending or receiving money, UPI will use your phone number, which is linked to your bank account and generate a unique UPI ID which is just like an ordinary email ID like xyz@axisbank.com. Simply put, all you would need to do is open the UPI app, select the amount to be paid, add the unique ID of your beneficiary, and select ‘Send’. You will get a confirmation password on your phone and once you approve the transfer, the money will get instantly transferred to the recipient’s bank account. In case of vendor payments also while shopping, you can make use of UPI and instantly pay your dues to the merchant using UPI payment gateway. The per transaction charges for UPI is below Rs.0.45 which will appear as IMPS transaction charges in your bank statement. Seamless fund transfer with Push and Pull facility. The transaction limit for UPI is Rs.1 lakh as against the transaction limit for IMPS which is Rs.2 lakhs per transaction. With UPI set to revolutionise mobile banking in India, the customers can look forward to the various benefits offered by it. What more? The service will be available real-time and 24x7.